This year’s award dinner will take place at the Fairmont on Thursday, November 3. The event will kick off a weekend celebrating the opening of the exhibition Bingata! Only in Okinawa and the museum’s fall symposium at the George Washington University. Individual tickets are now available at $250 per person. You are invited to become a sponsor of the 2016 award dinner with a donation between $1,000 and $10,000. All contributions support The Textile Museum. Named for The Textile Museum’s founder and given by the Board of Trustees, the George Hewitt Myers Award recognizes an individual’s lifetime achievements and exceptional contributions to the field of textile arts. This year, the award will be presented to Yoshiko Iwamoto Wada for her artistic and scholarly contributions to the textile field. Yoshiko is celebrated globally as an artist, curator, historian, and teacher in the textile and fiber art world. With nearly forty years of experience, she has continually advocated and advanced the historic textile and contemporary fiber art field. Yoshiko has curated exhibitions at the Museum of Craft and Folk Art in San Francisco, the Jim Thompson Art Center in Bangkok, and co-curated The Textile Museum’s 1996 exhibition The Kimono Inspiration: Art and Art-To-Wear in America. Furthermore, Yoshiko is an accomplished artist and the author of numerous publications on Japanese art and shibori technique. 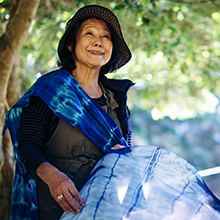 In addition to her academic and artistic achievements, Yoshiko is President of the World Shibori Network, founder of Slow Fiber Studios, producer of the Natural Dye Workshop film series, and co-chair of the 10th International Shibori Symposium in Oaxaca, Mexico. 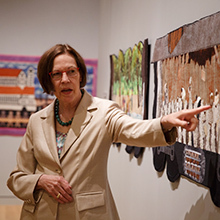 During the George Hewitt Myers Award Dinner, the Board of Trustees will also present The Textile Museum’s Award of Distinction to Rebecca A. T. Stevens, a consulting curator for contemporary textiles at The Textile Museum for over three decades. The Award of Distinction recognizes exceptional contributions that have significantly advanced the museum in the fulfillment of its mission. Rebecca will be recognized for her significant influence in establishing the museum’s contemporary textile arts presence through the years. Among the multiple exhibitions and accompanying catalogues that Rebecca has helped to organize for The Textile Museum are The Kimono Inspiration: Art and Art-To-Wear in America co-curated with this year’s George Hewitt Myers Award Honoree Yoshiko Iwamoto Wada, Green: the Color and the Cause, Technology as Catalyst: Textile Artists on the Cutting Edge, and most recently Stories of Migration: Contemporary Artists Interpret Diaspora.